Have you ever scratched your head how busy entrepreneurs manage to keep several social media profiles alive? How they seem to be online 24/7, posting updates, engaging with followers, and still find time to run their business? How can you do this with your own social media presence? They feel so overwhelmed and ‘social-media-incompetent’ that they don’t even start. They have created several profiles, but they post very infrequently. A Facebook page may get a few posts in a row, then they forget about it for 3 months, then they go back to posting … and so on. You probably know the routine! They are frequent posters and engagers, but it costs so much time, that vital areas of their business suffer. They engage a lot, while conversions and sales are dying.You just can’t hang out 90 minutes or more on social media profiles every day. Especially if your following is small and you’re seeing dismal results. Here are 5 steps how you can master your social media profiles efficiently. If you implement these ideas, you’ll achieve more in 30 minutes a day than you’d otherwise achieve in 2 hours. I’ve ordered them in a step by step sequence. Start at #1; only move ahead to the next step once you’ve mastered the previous one. Being clear about your social media goals will not only save you time, most of all it will help you getting much better results from your activities. Most people developed their daily routine randomly. They’ll login to their accounts, skim the news, check for interactions from their followers. As a result of what they find, they’ll post some random shares and answers. You guessed it: regarding your social media MARKETING this won’t get you far while costing precious time. Knowing your goals not only tells you what to do, it also tells you what not to do, what not to waste time on. If your goal is getting traffic for your web site, you’d focus on posting links, finding the right words to get great click through rates, finding the best time to post for maximal response. Wouldn’t it be great if we could mesh it all together? Yes. But, sorry, not working. Your results follow your focus. You need to decide what your goals are. This post is about being efficient with social media. Of course there are times when you go to Facebook for fun, for connecting with friends. But during your working hours I recommend not getting distracted and focusing on using social for your business goals. How to do it? It’s easy. Establish a daily routine and stick to it religiously. What to do? This includes which sites to visit (and in which order), what tools to open, and what activities to do with sites and tools. How much time to spend on each activity each day? At first you’ll need a few days to figure out how much time you need for the specific tasks. Fortunately, everything you can do on social media is repetitive (see daily routine list below). Once you’ve established the daily routine, things are easy. Your daily routine will most likely include these 5 activities. Share your own updates with your followers. Share other people’s content with your followers. Interact with other people’s content (commenting). Review interactions and answer (comments on your updates, messages). Once you’ve mastered the ‘what to do’ manually, it’s time for the next step: using tools to do things faster. The first thing that comes to mind are probably external tools like SproutSocial or HootSuite. These tools combine information from several social media sites into one dashboard. Using these dashboards you can review other people’s streams and their interactions with you, and you don’t even have to visit Facebook, or Twitter, directly. You can use RSS readers to speed read the daily posts from hundreds of blogs on one page. Using feed readers from inside tools like SproutSocial even allows to directly share blog posts to your social networks. The second group of tools are the features social media sites themselves offer. My favorite example are Twitter lists. I’m following more than 3000 people. As a result of that my ‘home’ twitter stream is useless. Too much noise, too much unimportant tweets. That’s why I use Twitter lists to quickly see (and interact with) Tweets from people who are important to me. Facebook has lists as well, and Google Plus has circles. What we’ve seen with tools so far was still manual work at the time of posting. You’ll save a lot more time automating things. You can use tools to schedule posts to go live at specific times, so you don’t have to be online several times a day. Other tasks to automate might be automatically sending messages to certain people, automatically posting content from trustworthy sources to your streams, and more. The number of tools is large, and so are the tasks they can perform for you. Employing assistants is the final step in our hierarchy of managing your social media accounts. It’s the last step because you should have done everything yourself first before you start managing people for the job. Your assistants might be some of your employees, if your business is large enough to have them. Or they might be freelancers hired to consistently perform specific tasks for you. I still like to be in control of my social media content, so I’m only outsourcing ‘risk free’ tasks to other people. When you look at my Twitter stream, for example, you’ll find frequent Tweets listing my new followers and saying ‘thanks for following.’ This is a repetitive task that I don’t need to do myself, I’ve delegated it to my assistant. And while I’m writing this post, my assistant is adding 150 new blog feeds to my SproutSocial RSS reader. How much or how little you delegate to others, is entirely up to you. 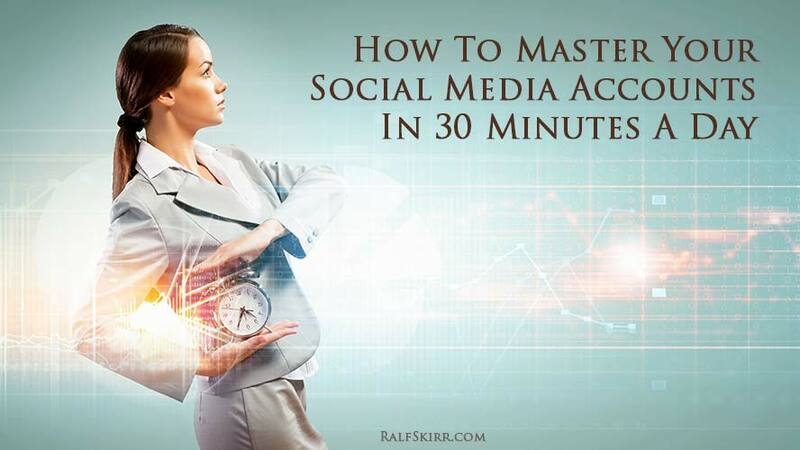 There you have it, five steps to manage your social media accounts with maximal efficiency. If you ever wondered how the social media celebrities get it done – there isn’t really a secret. It’s as simple as having a daily routine and not wasting time getting sidetracked.